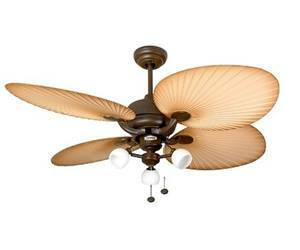 Ceiling Fan Palm Florence 132cm / 52" with Light Ceiling fans for domestic and professional environments Ceiling fans with lights 120 - 139 cm / 47" - 55"
Get yourself a piece of the Caribbean. 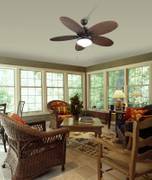 This ceiling fan creates an atmosphere of vacation everywhere thanks to its chocolate brown housing and the 4 palm blades. On the inside of the housing a 3 speed fan motor powers the voluminous fan blades and can be controlled with a pull cord, the same goes for the integrated ceiling light. Ceiling to blades: 36cm / 14.2"
Ceiling to bottom of switch housing: 55cm / 21.7"